Flat Rock Trailhead road/parking lot and the main parking lot by Pavilion #1 are closed. Please use the equestrian parking lot to access the Flat Rock Trail via the Rattlesnake Trail. A new connector trail between Rattlesnake Trail and Flat Rock Trail has been built - please use this trail to go to Flat Rock. Due to the campground project work, the Colonel Denning Campground will be closed for the entire 2018 camping season. Camping may be available at nearby state parks. Updates for availability will be made as the project is finalized. Thank you for your understanding. Colonel Denning State Park, in north-central Cumberland County, has 273 acres of woodland and a 3.5-acre lake. 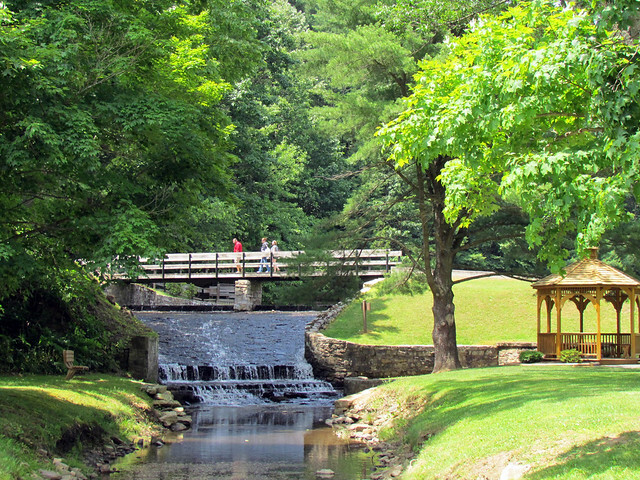 The park serves as a gateway to the 96,000-acre Tuscarora State Forest, which surrounds the park. These scenic and historic public lands are located in Doubling Gap, so named by the “S” turn where Blue Mountain doubles back on itself. The park is eight miles north of Newville and nine miles south of Landisburg, along PA 233. A visitor center, exhibiting plants, animals, and minerals found in the park, is open during the summer season.